Find places to stay in Placerville, CA and other fun things to do. View our list of attractions, activities, events, restaurants and visitor information. Boasting a garden Bella Vista Bed and Breakfast is set in Coloma and also provides a terrace and a shared lounge. A hot tub is available for guests. Both free WiFi and private parking are available at this property. Free Internet,Outdoor Pool, Non Smoking Rooms. Currently as low as $113.00/night! Our guests enjoy freebies like breakfast and Wi-Fi and an outdoor pool and hot tub at the non-smoking Best Western Plus Placerville Inn set against the backdrop of the scenic Sierra foothills just minutes from Red Hawk Casino. Free Internet, Swimming Pool,Outdoor Pool, Pets Allowed, Non Smoking Rooms. Currently as low as $288.83/night! This Gold Country B&B is 6.4 km away from Marshall Gold Discovery State Historic Park. It serves a full gourmet breakfast and boasts individually decorated contemporary guest rooms with free Wi-Fi. Free Internet, Pets Allowed, Non Smoking Rooms. Currently as low as $63.48/night! Guests at Placerville's Gold Country Inn are within walking distance of restaurants and coffee shops and a free shuttle service and Wi-Fi add to the long list of conveniences. Free Internet, Non Smoking Rooms. Currently as low as $64.00/night! Located 1 hours' drive from Sacramento International Airport this Placerville California motel offers rooms with free Wi-Fi. South Lake Tahoe is 55 miles west of this motel.Each room provides a desk cable TV and an en suite bathroom. Free Internet, Pets Allowed. Currently as low as $89.00/night! 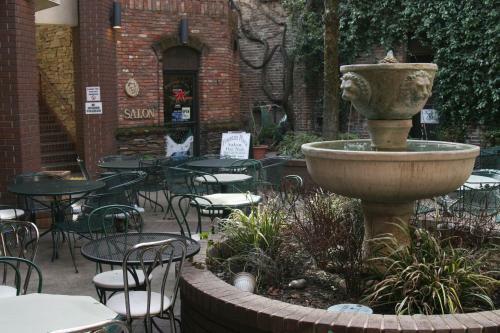 The Historic Cary House Hotel is a unique lodging option for our guests in downtown Placerville that successfully mixes 19th-century charm with modern amenities like free Wi-Fi and an on-site spa and wellness center. Free Internet, Pets Allowed, Non Smoking Rooms. Located off Highway 50 in the heart of Gold Country this motel features an outdoor swimming pool and rooms with free Wi-Fi. A 24-hour reception and free parking are offered to guests.A cable TV is featured in each air-conditioned room at Mother Lode Motel.Outdoor Pool, Pets Allowed, Non Smoking Rooms. Just one mile from downtown Placerville is the National 9 Inn which treats our guests to free Wi-Fi free continental breakfast and in-room microwaves and mini-fridges. Non Smoking Rooms.